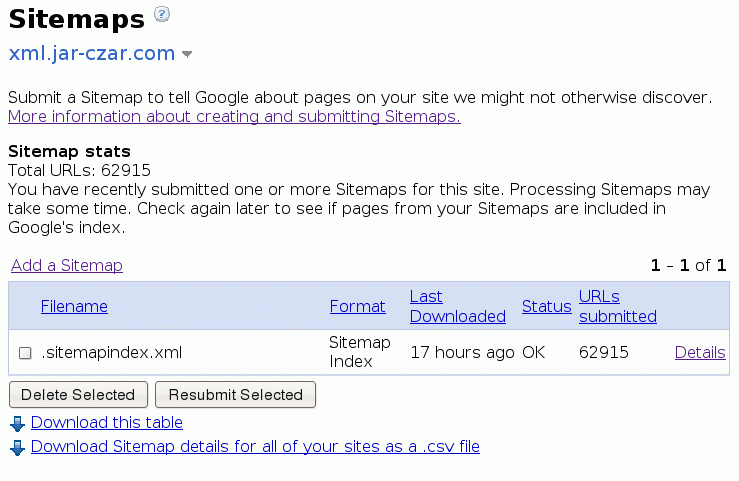 submitting sitemaps to google and yahoo | Honey Baked Goodness! Since the core of my application is xml data instead of html data, I attributed the blame to that. I know, I know… Google and Yahoo both tell you it can take 3-4 week and even then it may not even happen. Google is really it for search. 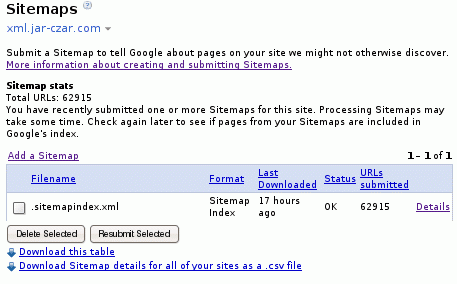 what do you mean by a sitemap? Before, I thought a sitemap was that lame part of a lot of web pages where they list “all” the pages of interest or all the starting points or some mess. That’s just a little taste, but you get the general idea (this is about 1mb of xml). Each sitemapindex can point to a max of 1k sitemap files which means it can indirectly address up to 50 million files. Google’s interface (as usual) is spartan and practical. You can add sitemap indexes and then you can view details as far as how many urls are reference, when it was downloaded, how many urls are processed and click to see stats for individual sitemaps. Right? Now I’m sure Google and Yahoo know about my files. That’s still no guarantee they will index them. Maybe that’s great if you have a site that sells commemorative plates of Chuck Norris fighting Donkey Kong, but the whole point of jar-czar is to provide a technical resource to Java developers. Every developer I know uses google….